This hard shell case's exterior is made of a dense, injection composite plastic for superior external protection against blunt forces, drops, and dings that can damage your USB Keyboard midi Controller. Interior protection consists of a Tri-Layer arrangement of a Convoluted Egg-Crate Foam Layer (Bottom1"), a Dense Pick & Pluck Foam Layer(Middle, 2.00") and a Convoluted Egg-Crate Foam Layer(Top Lid, 1"). With the combination of a highly durable exterior and dense foam interior, you can be sure your music equipment has reliable storage and protection. The locking mechanism accommodates 2 padlocks for keeping your devices secure. 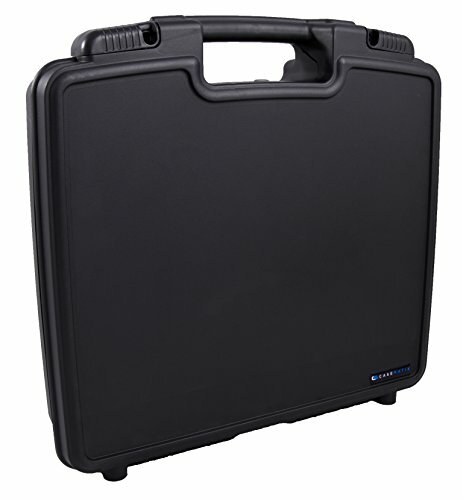 This hard case is ideal for transport using its convenient carrying handle or placing it inside a larger bag. Know your mixer is protected and feel confident bringing your DJ controller to parties , events and more. This case Measures 15.5" x 15" X 4" in exterior dimensions and the internal customizable foam can accommodate controller and Accessories within maximum dimensions 13.25" x 10.5" x 2.0". The Pick & Pluck 2.00" thick middle layer of foam consists of individually pluckable cubes. You can conveniently Customize this case to fit your controller to your liking by removing a solid square block of foam from the center of the case. Pull the cubed foam to create needed compartment and keep your Mixer snugly held in place. The foam compartment provides full impact protection from all angles and absorbs shock from impacts.